Do your children get sick all the time? Do you frequently feel tired and run-down? Is it nearly impossible to get your children to eat fruits and vegetables? 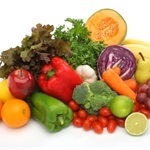 Are you lacking the recommended 7-13 servings of raw fruits and vegetables each day? If the answer to any of these is yes, then the benefits of Juice Plus+ are extremely important for you and your family. For many years now the National Institutes of Health, the American Cancer Society, the American Medical Association, the American Academy of Pediatrics, and every other national health association has emphasized the importance of eating at least five servings of raw fruits and vegetables every day. These benefits are not only due to the individual vitamins and minerals we all know about, but also from the thousands of other enzymes, antioxidants, phytonutrients, and fiber contained within the raw fruits and vegetables. There are many more potential benefits of these nutrients such as improved intellectual function, better eyesight, and increased energy level. In short, our bodies simply function more efficiently. How many people actually eat 7-13 servings of raw fruits and vegetables every day? Some Americans may eat an orange with breakfast and maybe an apple with lunch and finish one or two cooked vegetables at dinnertime. However, many fall short of the quantity of fruits and vegetables that are recommended. Juice Plus+ is more than extra vitamins and minerals. It is actually a whole food based supplement. The fruit capsules are made from apples, oranges, pineapples, cranberries, peaches, cherries, papayas. The vegetable capsules are made from carrots, parsley, beets, kale, broccoli, cabbage, oat bran, rice bran, spinach, and tomatoes. There is also a “berry blend” made from 25 fruits, vegetables, grains and berries including concord grapes. How is Juice Plus+ made? The fresh fruits and vegetables are juiced and then dehydrated to a powder form. It’s carefully tested to ensure no pesticides or other contaminants are present in the product. It is never exposed to high temperatures that would destroy the nutritional value of the fruits and vegetables. When re-hydrated with water, the nutrients are absorbed into our bodies as if we had gotten them directly from the fruits and vegetables themselves. Is Juice Plus+ as good as eating fruits and vegetables? There’s no complete substitute for eating the real thing. But how many people actually eat such a wide variety of raw fruits, vegetables and grains every single day? Juice Plus+ is a convenient way to ensure you and your family receives all the benefits over time from adding more nutrition from fresh fruits and vegetables to your diet. But my child already takes a multi-vitamin. Why does she need Juice Plus+? Juice Plus+ is not a vitamin supplement which contains, at best, only a small number of pre-selected antioxidants. It is a whole food based supplement containing nutrition from the thousands of antioxidants and other nutrients found in fruits and vegetables. Some children may need vitamin supplementation, but every child needs Juice Plus+. Is there any scientific proof that Juice Plus+ really works? To my knowledge, no other nutritional product in history has been subjected to as rigorous scientific investigations as Juice Plus+, which has been investigated by scores of scientists at leading hospitals and universities all over the world. The results of more than 25 such studies have already been published in peer-reviewed scientific journals – and numerous other studies are currently underway. The published studies indicate that Juice Plus+ delivers many beneficial health results from clinical research. This all may sound complicated, but the simple truth is that Juice Plus+ is the best way to get your entire family to reap more of the healthful benefits of a diet rich in raw fruits and vegetables. Juice Plus+ comes in capsules for adults or children and even tasty chewable tablets: adults or children. Try Juice Plus+ today!